An Incident which will shake the foundations of Deobandi group. Hold fast to your seat, and be ready to read this hair raising incidence from “ Sawaneh Qasimi”, the biography of Mawlana Qasim Nanotvee, founder of Darul Uloom Deoband. 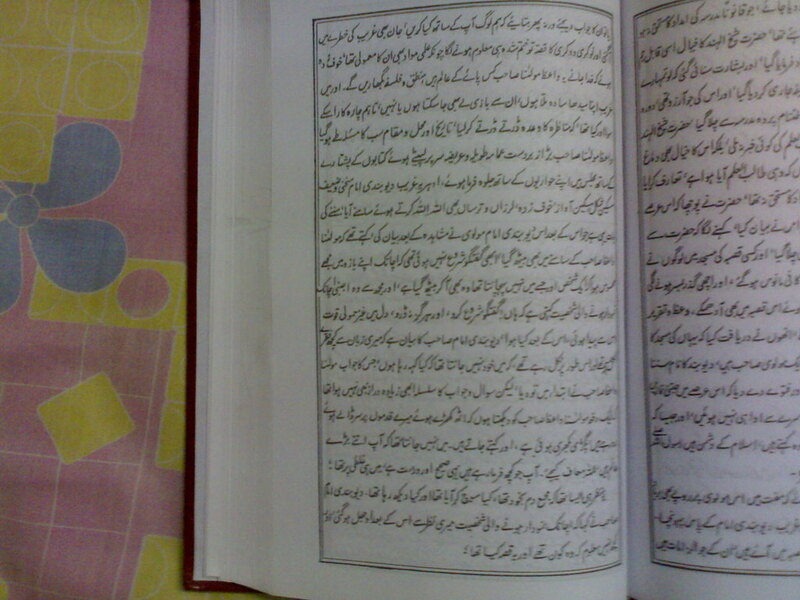 The biography was written by the giant Deobandi scholar Mawlana Munazir Ahsan Gilani . The book was published by Darul Uloom Deoband itself as a mark of respect to their founder and Qari Tayyib , was honoured to have his name written as publisher. 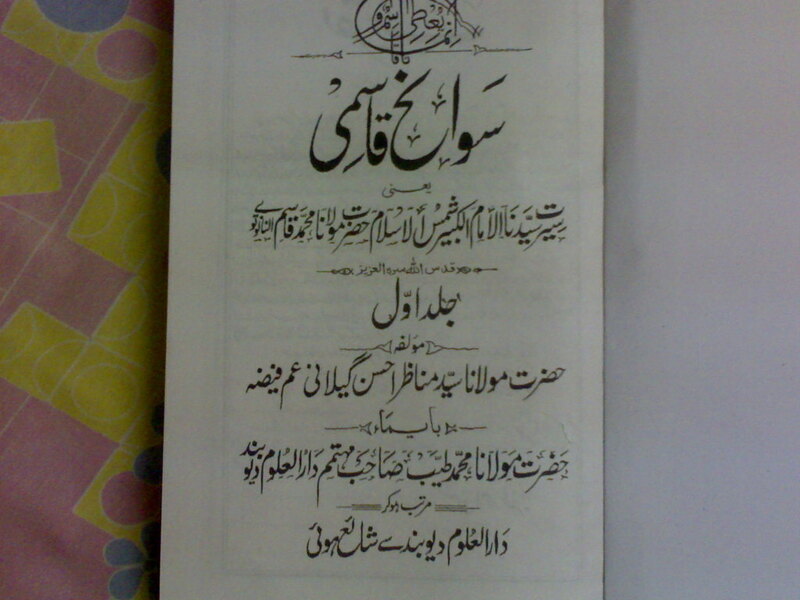 Mawlana Munazir Ahsan Gilani narrates an incidence on the authority of Mawlana Mahmudul Hasan, (another great Deobandi Scholar). “ People from a small town appointed this young Mawlana (from Darul Uloom Deoband) as the Imam of their Masjid. The inhabitants of the town soon became friendly with this Mawlana .After a few months, another” wandering” Mawlana came to this town and started preaching and giving lectures. A few people got impressed from this Mawlana too.The new Mawlana asked who the Imam of the masjid was and he was told about the young Mawlana from Deoband. As soon as this new Mawlana heard the name’ Deoband” he got furious and issued a verdict that all these months the salah performed behind this Deobandi Imam was not valid. The inhabitants of the town were very depressed and thought that they have not only wasted their money on this Deobandi Scholar (paying salary) but also their Salah( prayer) were invalid. One man approached this Deobandi Scholar and said, Mawalana either you refute this new preacher who has come in the town or else you decide what should we do? The young Deobandi Mawlana was much tensed and thought that he is now about to lose his job (of Imam) as his knowledge is less and this new preaching Mawlana might give him lectures on Logic and tasawwuf. Having all these fear in mind, the young Mawlana still accepted the debate challenge. Date, time and place were fixed for the debate. On the appointed date the new preacher came with his magnificient turban on his head, with loads of books and his supporters. Where as, this poor Deobandi Imam with dull face, feeble voice, full of fea,r appeared remembering Allah. (Allah Allah kartey huaey samaney aaya). The young Mawlana narrated that before the discussison could start (with preacher Mawlana ) he realized some unknown man coming and sitting next to him and told him “ Yes, start the discsussion, don’t fear”. With this assurance he got some comfort and power in his heart. The Deobandi Mawlana continued and said after this he was not aware what was coming out from his tongue. The preacher Mawlana did try to answer some question in the beginning, but then I saw that this preacher Mawlana stood up and placed his head on my feet, his turban was all scattered, he was crying and saying “ I did not know you were such a big scholar. Please forgive me for the sake of Allah. What ever you are telling is truth and I was on fault”. After narrating till this part of the story, Mawlana Munazir Ahsan Gilani unveils a secret which is the central part of my discussion. Hazrat Shaykhul Hind (Mawlana Mahmoodul Hasan) asked that young Deobandi Mawlana about the appearnce of the man who came and sat besides this youmg deobandi scholar. ANALYSIS OF THE WHOLE EPISODE. First, look at how open heartedly this has been accepted by our Deobandi friends that Mawlana ( Qasim Nanotvee) came to know the unseen as much as that he came to know that a Deobandi scholar is struggling and is in need of help at such and such place . Mawlana Qasim nanotvee immediately walked towards him to help him. Secondly, this has also been accepted that he can come out of his grave and walk freely where ever he wants. Thirdly, Deobandi scholars can come after their death to help their followers, but with regard to Prophets and Awliya, (Friends of Allah) this is not accepted!! After narrating this incidence Mawlana Manazir Ahsan Gilani might have suddenly realized that in his school of thought ( Deoband) , they do not accept this type of belief . Rather we call this type of aqidah as’ Mushrikana Aqidah”, so how can this story be accepted? Instead of denying this “imaginary story” (told to him by Mawlana Mahmoodul Hasan), Mawlana Manazir Hasan murdered the Deobandi belief only in order to prove the “super human” ability of his beloved, Mawlana Qasim Nanotvee. I am sure; such a shameful act of denying one’s own belief will not be found in the history of any Islamic sect. After narrating this amazing incidence, Mawlana writes a commentary on it. Some of you might be shocked to read this! Subhan Allah! This is the light of truth! On matter of taking help from the spirits of the dead , the same question which we Ahlus sunnah used to ask them , now they are asking this question to themselves! Only those who consider this as ‘ kufr and shirk’ should answer this . 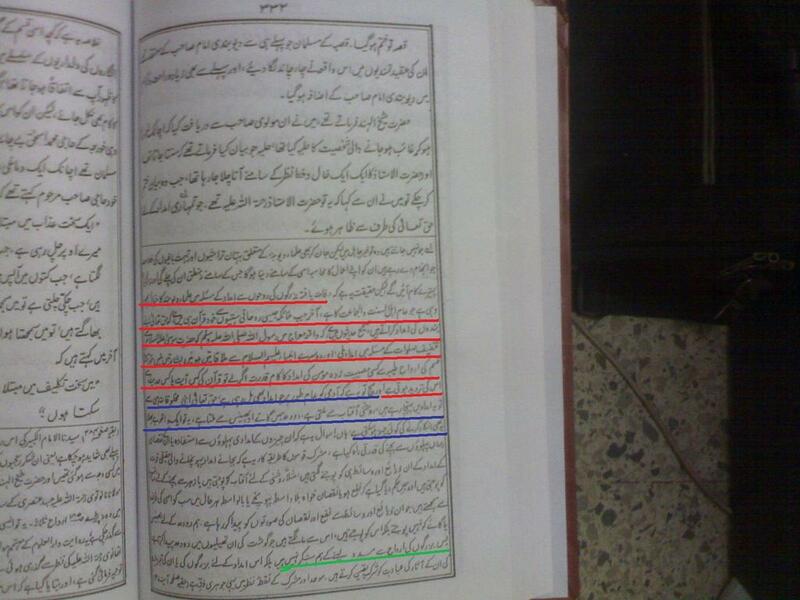 In this commentary Mawlana Manazir Ahsan Gilanai accepted that this is the belief of Ahle sunnat wal jamaat!. Coming back to the original story. Now read the next part of the commentary. It says “And the truth of the matter is , what ever help human beings get in this world , Allah is providing this help thought His creations itself like brightness from Sun, Milk from Cow and Buffalo. 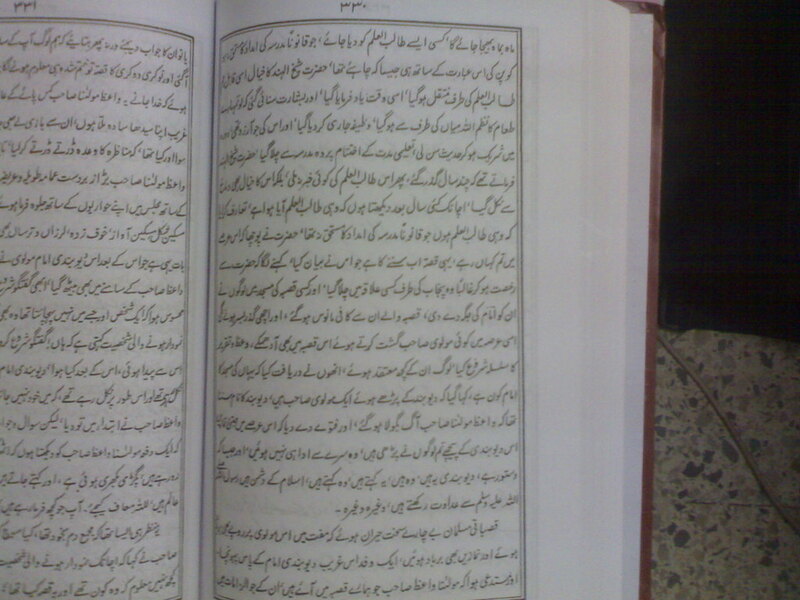 This is a ( authentic) narration, how can some one deny this”? Original wording: Buzurgon ki arwah sey madad lenay kay hum munkir nahee hain ! It seems Mawlana Manazir Ahsan Gilanai never had the chance to read Barhaney Qatiya written by by his own group memeber Mawlana Khaleel Ahmed Ambethavee. The book clearly states’ that knowledge of the unseen possessed by angles of death and Satan is proved from Quran and Sunnah , but no such proof is available for Prophet ( sal allahu alaihi wa sallam) and any who thinks prophet had the knowledge of the unseen is in CLEAR SHIRK.!! Do we see this? When the super human quality of Mawlana Qasim Nanotvee is at stake, then all sorts of hadith and Quranic verses are brought to support their claim! When super human quality of Mawlana Qasim Nanotvee is at stake ,all the logic and examples like cow and milk are used ,, just to maintain the high status of Mawlana Qasim Nanotvee. But alas! When the best of the creation, the most beloved of Allah, and the seal of the prophet hood is attacked, then no one came forward! Where were all these quranic verses , hadith and examples when some of your scholars said that to get a thought of prophet is Salah ( prayer) is worse than getting the thought of Ox and Horse? Where were these hadith of Mearj when some of your scholar equated the prophetic knowledge of the unseen with knowledge possessed by animals and lunatics? Why did you not explain at that time, that the Knowledge of prophet is directly from Allah and Allah chooses to give the knowledge of the unseen to His most beloved prophet? The answer is straight. We defend whom we love and what we think as truth. When the status of Mawlana Qasim Nanotvee was at stake , when it was to be proved that Mawlana can come from his grave, walk freely and sit where ever he wants , that time it was said that ‘ Allah chooses spirits ( ruh) to help others” .When it was to be proved that how Mawlana got the knowledge in his grave ( alame barzakh) that his follower is in problem it was said” Allah gave this knowledge”. But sad to share , some people show lack on interest in refuting those who have shown and still show disrespect to prophet. Go to any Deobandi and ask ‘did prophet have the knowledge of the unseen”? And you will get an answer“ Prophet had the most knowledge among all the creations”! He will still not say that prophet had the knowledge of the unseen given to him by Allah. They still do not accept clear quranic verses, but they have big heart to accept that “Allah told Mawlana Qasim Nanotvee that , go to that village and help your follower”! It is also important to see what the forefather of Deobandi group, Mawlana Islmaeel Dehalvee wrote in his famous book” Taqwiyatul Iman”. “Full filling wishes, removing difficulties, providing help at times of danger, all this belongs to Allah only and no prophet, awliya, spiritual guide, martyr, ghost or fairy can provide help of any sort. Any one who makes a vow for them or remembers them at times of danger, he becomes a mushrik.. What ever be the belief , whether these people have self power to provide help or that THEY ARE GIVEN THIS POWER BY ALLAH , TO PROVIDE HELP , IN ALL CASES IT IS SHIRK !! Deobandi have to now either kill this belief written in Taqwiyatul Iman or agree that above incidence mentioned is full of shirk !! I leave it on them to chose.